Beautiful Virgin Mary medal with glittering Diamonlux™ CZ's add sparkle and femininity to a timeless style. looks good for my kid! We bought two of theses for christening gifts and they are absolutely beautiful. 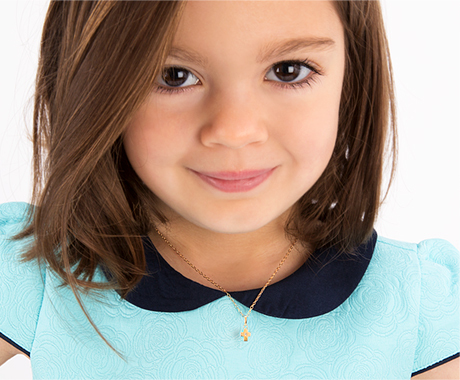 They are daintyand perfect for a child and to cherish. I got this for my niece baptism, it was way more pretty than in the picture , the only thing it was really small , but for a baby is more than perfect. I was looking around for the perfect necklace for our goddaughter’s baptism and came across Tiny Blessings. I immediately fell in love with all of the jewelry! It arrived in a beautiful package. I was highly satisfied, will definitely purchase more jewelry!